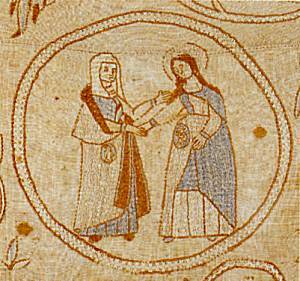 "La broderie au point de croix, tradition féminine réinventée"
Il est conseillé d'acheter les billets à l'avance à la caisse du Musée Alsacien. - "Broderie traditionnelle: l'essuie-mains d'apparat, le plastron, le bonnet de de coiffe"
In the catalogue one of the chapters describes the development of the factory DMC in Mulhouse. 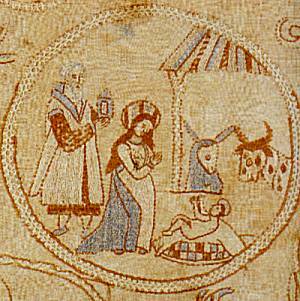 This is also the history of the embroidery yarn DMC and of the family Dollfus-Mieg. This was also the place where Thérèse de Dillmont had her embroidery atelier. Here she created her pattern books on embroidery. The exhibition shows some 'tableaus' of Thérèse de Dillmont's collection of international embroidery. This is the collection where the inspiration to her famous embroidery pattern books came from..
exhibition also shows a linen embroidery. 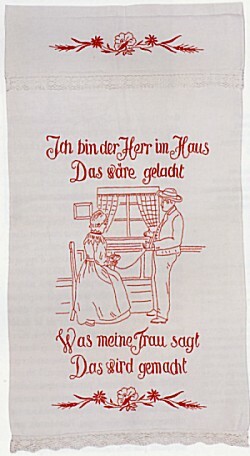 It points to the fact, that the rhine region has a very old tradition in embroidery. Fashioned after the Parisian style of mansions, it was built between 1732 and 1742 "between court and garden" according to the plans drawn by Robert de Cotte, first architect of the King for the Cardinal Prince Bishop Armand-Gaston de Rohan-Soubise, illegitimate son of Louis XIV. Four Rohan Cardinals would successively occupy the Bishop's throne of Strasbourg between 1704 and 1789. 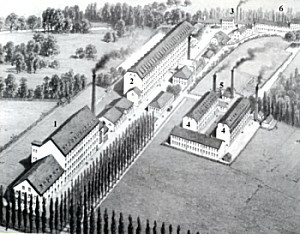 At the beginning of the 19th c. it became the resisdence of Napoléon of whom the Alsatians were very fond. Besides the "State Apartments", built in the same order as Versailles, the Palace houses the Decorative Arts Museum, the Fine Arts Museum and the Archeology Museum. It was established in 1907 in three beautiful Renaissance houses. The alsatian museum is a folk art museum featuring essentially rural customs and ways of life depicted through usual items such as furniture, ceramics imagery, costumes. Embroidery enjoyed a revival some ten years ago and ever-increasing numbers of women enthusiasts are re-discovering its attractions. 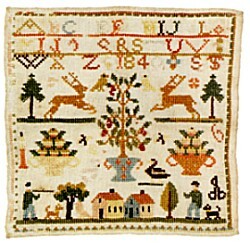 Alsatian cross-stitch embroidery with its use of the Rouge du Rhin thread is of course well-known by now, but the exhibition also offers an opportunity of discovering many other of its features with a display of some 200 pieces from the collections of the Strasbourg Museums that are seldom on public view. They bring out the regions particular place as a crossroads where popular traditions of central Europe and the influence of Paris fashion converge. 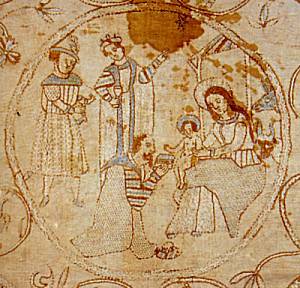 Taught at school as calligraphy, the art of embroidery serves to mark linen and to adorn cloths associated with Jewish or Catholic rites of passage. 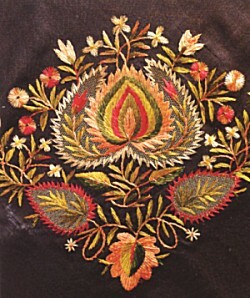 A sartorial embellishment, embroidery is prominent on 18th-century silk waistcoats, on shawls and peasant womens bonnets. 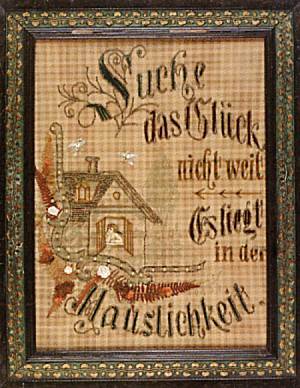 Needle-painted pictures or ceremonial hand towels contribute to interior decoration in town and country. Envoyer par fax ou courrier votre demande dexemplaires à lattention de Guy Fritsch, responsable financier, qui fera suivre votre demande. Une remise de 30 % sur le PPHT est consentie aux libraires par arrêté municipal. Une participation aux frais denvoi forfaitaire denviron 3 euros sera demandée. Lenvoi des exemplaires seffectuera (en courrier normal) à réception du bon de commande ou de votre demande écrite. Le paiement devra seffectuer à réception de lavis dencaissement du Trésor Public (par chèque ou virement bancaire).